Editor’s Note: Do you struggle to know how to pray for your husband? Let this prayer outline guide you in praying for him and for yourself as you seek to love your husband as Christ has loved you. Wherever you see “____”, simply say your husband’s name. Father, I want to honor You and the gift of our marriage. You have charged me with the duty of respecting my husband. I’m here to ask for help. I truly want our marriage to be successful and enjoyable. You designed marriage to reflect Christ’s unity with the Church. As ____’s bride, I want to excel at honoring and following him as wholeheartedly as the Church reveres Christ Jesus. Everywhere I turn, I see wives showing contempt for their husbands with their words, the roll of their eyes, and especially with their priorities. I’ve been right there with them at times. The temptation to disregard and disapprove of my husband and seems relentless some days. It’s easy to drift toward independence and separate myself from certain things he thinks and does. You are more powerful than the media, my sinful habits, and Satan’s schemes! You are my source of help and hope for a truly great marriage. Sign me up for Your Respect University, God. Holy Spirit be my advisor, teacher, tutor, and confidant. I’m ready to learn to do this Your way. I want to plumb the depths of Your definition of respect and I’m starting here in Ephesians 5:33b (Amplified). I am embarking on an adventure of exploring my husband, celebrating him, admiring Your goodness in Him, forgiving him, helping him, interceding for him and revealing Your gospel to him. Lord, hear my prayer for help as I lovingly assume in each of these roles. Lord, make me a great student of ____. Guide me to explore his past and show me the golden thread of Your presence. Help me to see his accomplishments and revelations of his good character. Show me his forgotten dreams. Underscore the experiences that left him feeling disrespected and help me learn from them. I want to pay attention to his preferences and honor him by selflessly choosing what he prefers. You know my selfish nature more than I do. I wonder if he will deny himself for my preferences too. Grow my faith in You, Lord, so that I resist this “what about me” thinking. I surrender my “what ifs” to you. You created ____ as a unique masterpiece. He is uniquely gifted by You to accomplish great things in Your kingdom. I look forward to exploring these things about him and using them as a foundation for my respect of him. God, You teach the Church to celebrate Jesus, her Bridegroom, with great fanfare including music and dancing. I want to live this way too, Lord. I want my life to be filled with jubilant praise to You. Teach me how to apply this celebratory praise to my relationship with ____. I’ve experienced his hunger for praise and I have judged him harshly for it. Please forgive me. Help me become the one he can depend on to celebrate him and his accomplishments. Inspire me to show my admiration for him in private and public, in small ways and in grand gestures. God, it’s easy for me to focus on our differences, which leads to bitterness and resentment. Soon I’m saying disrespectful things to him and about him. Help me, Lord. I want to resist this temptation. I want to see our differences from Your perspective. You instruct me to think about things that are pure, true, excellent, noble, commendable, and praiseworthy (Philippians 4:8). I’m ready to see these things about ____. I choose to live out our days together thinking about ____’s noble and praiseworthy attributes. I am relying on You to reveal them to me and remind me of them when I am at risk of disrespecting him. You have loved and accepted me just as I am. You have forgiven me for so much. I have not thanked You for this enough, Lord. ____receives the same mercy and forgiveness from You and You require me to give it to him. (Matthew 6:14-15) But I am prone to hold grudges. Sometimes, I want him to earn my admiration. Lead me away from the temptation to serve my flesh, Lord. (Romans 8:5-6) Help me to forgive him for every offense. I want to value him regardless of his mistakes and weaknesses. I want to consistently esteem him above all other earthly relationships. Jesus humbly left the riches of Heaven to help us have a life with You and Your extravagant riches. He knew we could never deserve the help we needed to be united to You, God. You’ve created me as a helpmate to _____. (Genesis 2:18) I have the privilege of representing the servant heart of Jesus to _____. Teach me to be a respectful helper who notices his needs and helps without being demeaning to him. You know all of our weaknesses and You have graciously appointed Jesus to intercede for us day and night. (Romans 8:34) I want to partner with Jesus as an intercessor for ____. Train me to exalt his struggles to You, Lord, with great confidence that everything is possible when You are involved. (Luke 1:37) As I surrender ____ to You, I trust that he will have access to all he needs to live an honorable life. Use me Lord, to reveal Your goodness within _____. Use my mouth to trumpet Your rich blessings within him. Use my touch to affirm how greatly You esteem him. Let every act of respect I show ____ lead him to revere and respect You even more, Lord. Let my faithful love for ____ consistently reveal Jesus Christ to him. In Jesus, I pray believing that I will flourish as a wife who greatly respects her husband. Ready to spend the next month praying over your husband and watching your marriage transform? Join us by starting the 30 Day Prayer Challenge for Your Husband! Jennifer O. 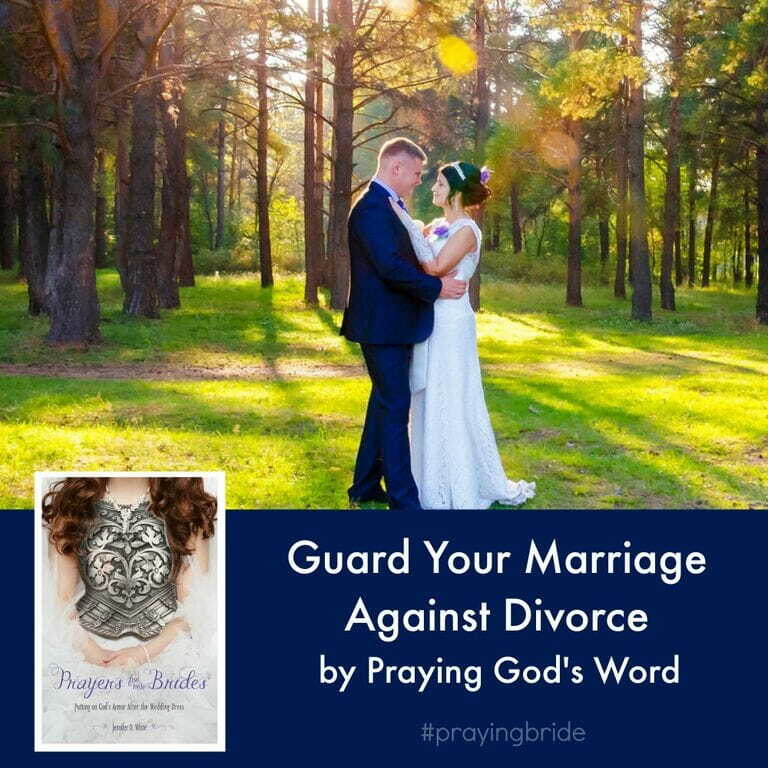 White is the author of Prayers for New Brides: Putting on God’s Armor After the Wedding Dress and Marriage Armor for the #PrayingBride. Jennifer is a natural encourager who offers hope from the truths of God’s Word at her blog, Prayerfully Speaking. With every blog post, Jennifer is exalts the one true God who can empower us to do more than we can ask or imagine.